Fabric is an essential part of the daily lives of all people, but the tasks of purchasing and choosing textiles have historically been gendered female. Dressing oneself and one’s family were essential skills for “good” housekeeping, tasks which required a basic understanding of what was available and in style. Aesthetic and economic value systems formed and shifted as women made their decisions. Knowledge of textiles was thus a key aspect of real and imagined femininity during the early- to mid-twentieth century in the United States. Racial, class, and aesthetic connotations were tied implicitly and explicitly to this knowledge. 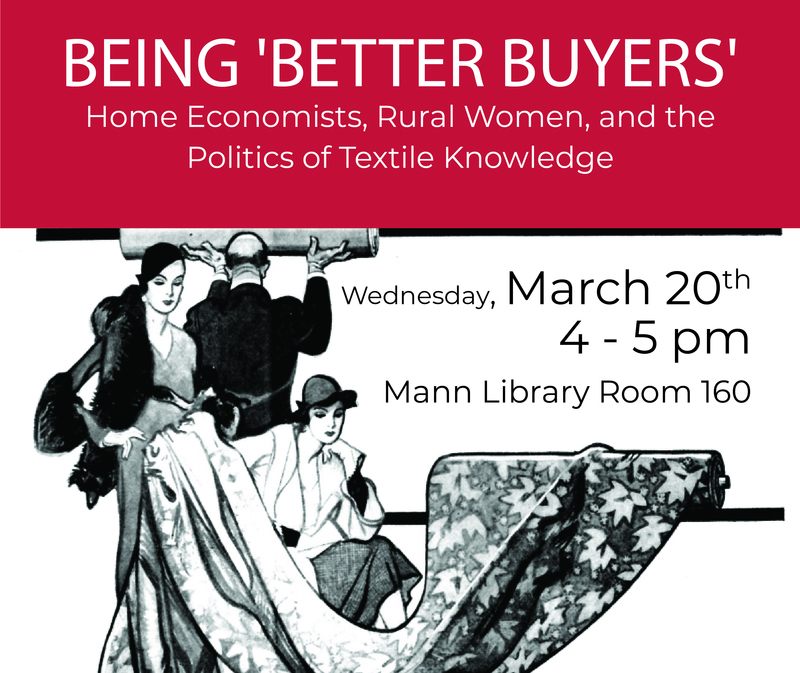 Alison R. Bazylinski, the College of Human Ecology 2018 Fellow in the History of Home Economics, will present her research in “Being Better Buyers: Home Economists, Rural Women, and the Politics of Textile Knowledge.” Her talk will explore the cultural histories of cotton and silk from 1920 to 1945 by examining how rural female consumers and home economists understood, used, and talked about textiles. Through these human relationships, as well as their interactions with textiles, Bazylinski examines how cultural meanings surrounding cotton and silk – economic, aesthetic, and social – came into being and shifted in the interwar period.